NextI was already a corrupted youth during the 80’s and it’s safe to say that Annie Lennox had no part in it. 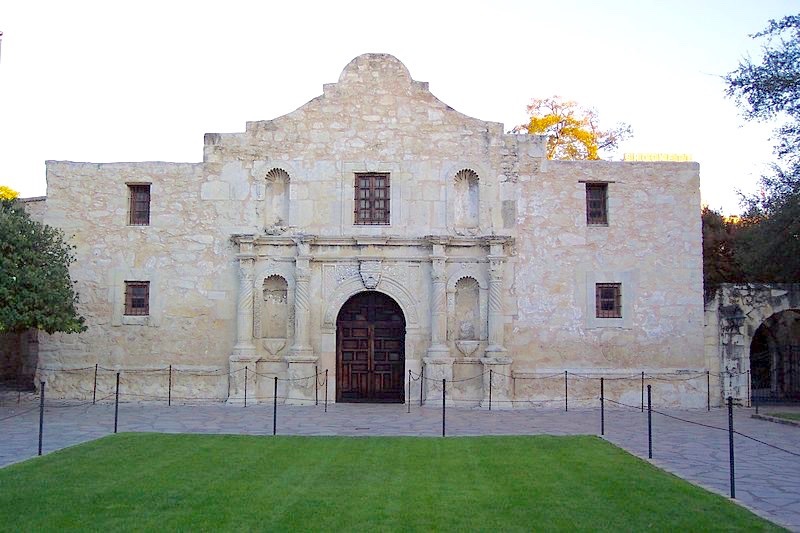 The site of the Alamo Mission in San Antonio helped give birth to Texas. Originally it was known as the Mission San Antonio de Valero and served as a Franciscan mission and fortress compound. It was used primarily for the education of newly converted Native American Christians for some 70 years until 1793. Thereafter, the Spanish government secularised all the missions located in San Antonio including the Mission San Antonio de Valero. Spanish soldiers in the early 1800’s would later occupy the former mission, converting into a new fort called “El Alamo” after the Spanish word for cottonwood. Decades later, after Mexico’s successful war of independence, it would still continue to serve as a military outpost (and briefly as a hospital) for its new masters the Mexican army. In 1835, the Alamo changed hands again, serving as a makeshift fort for Texan revolutionaries, who had successfully ousted the Mexican forces located in San Antonio. As part of arguably the most pivotal moment in the Texas Revolution, Mexican General Santa Anna crossed the Rio Grande River to restore order and quell the rebels that had taken over the former Franciscan mission in the Mexican province of Texas. On the 23rd February, 1836, a bombardment began in an attempt to reduce Fort Alamo’s walls to rubble. By the March 6th, 1836, the impatient Santa Anna ordered a direct assault on the fort and broke through a breach in the outer wall of the courtyard in the early hours of the morning. After a fierce hand-to-hand fight, all but a handful of the Alamo’s defenders were killed. For a little over a month following the battle, a Mexican garrison reoccupied the Alamo, but abandoned it after news broke of the defeat of General Santa Anna at the Battle of San Jacinto. During their retreat they apparently knocked over several more walls and set fire to the Alamo complex. Several drawings and paintings have shed some light on what the Alamo Mission looked like following the Battle of the Alamo. The header image immediately above shows a drawing of the Alamo mission in San Antonio, first printed in 1854 in Gleason’s Pictorial Drawing Room Companion. It’s accuracy is open to interpretation, but it is probably safe to assume that it is close to what the Alamo looked like in the years after the famous battle. 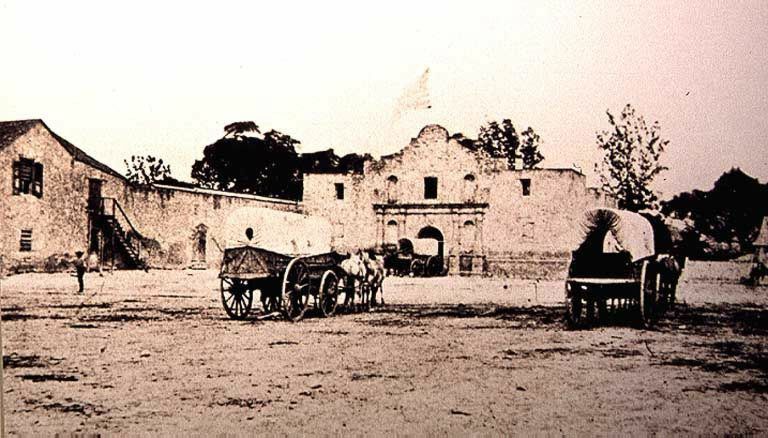 Interestingly, following the annexation of Texas by the United States in the mid 1840’s, and some time after many artists such as Edward Everett and Captain Seth Eastwood, had sketched the crumbling site of the Alamo, it was significantly repaired under the supervision of the United States Army. A new roof and the campanulate, or bell-shaped parapet to the chapel was a most welcome addition. 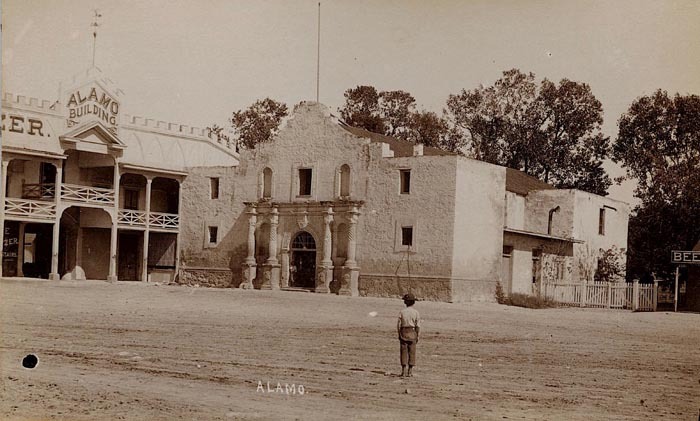 Alamo buildings in use as Army supply depot, circa. 1850-1870. The Hugo & Schmeltzer store (on the left) on the site of the Alamo, circa 1885. As the years turned into decades, the Alamo continued to serve as a military outpost until eventually the United States army abandoned it in favour of Fort Sam Houston in San Antonio. In time, the Alamo and its surrounding complex was swallowed up by development in the 1880’s. Notably, the mercantile firm, Hugo & Schmeltzer operated a store on the site of the Alamo, before it was eventually demolished in favour of redeveloping the original compound grounds as a historically important site with a museum in the early 20th century. Issues pertaining to the ownership and preservation of the Alamo mission had caused much angst over the years. The Roman Catholic Church, the daughters of the Republic of Texas and Texas legislators in particular all argued periodically about what they thought was in the best interest of the Alamo. One of the more serious proposals tabled, tried convincing the Alamo’s caretakers to restore the mission chapel to its original 18th century appearance, rather than as a museum about the exploits of Texas Revolutionaries. Fortunately, there is room for both, as visitors today (as they have done for decades) can elect to tour the chapel, as well as Long Barracks, for a nostalgic history lesson on the Texas Revolution. Today, the General Land Office maintains authority over the Alamo. The Alamo is also a recently added World Heritage Site (2015). Photo Credits: The header image of the drawing of the Alamo Mission in San Antonio is in the public domain. It was first printed in 1854 in Gleason’s Pictorial Drawing Room Companion. Images of the Alamo, dated circa 1850-70 and 1885, are presumably also public domain. The modern-day image of the Alamo, in San Antonio, Texas, is used under the Creative Commons Attribution-ShareAlike 2.5 license. This was a very interesting post. I’ve always thought the Alamo was an intriguing subject. The old photographs are fascinating! Thank you for sharing this.